Tens street vendors (PKL)s who occupy sidewalk on Jalan Kalilio, Senen Urban Village, Senen, Central Jakarta were controlled by joint personnel. Controlling is done to return sidewalk function thus pedestrian can be more comfortable in using it.
" We are directly go to control the location after getting report this morning that PKLs come back to sell on that location again"
"We are directly go to control the location after getting report this morning that PKLs come back to sell on that location again," stated Alfalast, Senen Urban Village Head, Friday (8/31). According to him, controlling was often done on Jalan Kalilio. His side gave minor criminal trial for disobedient PKL and tookl their carts. 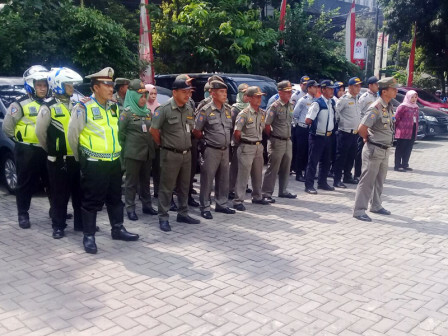 Meanwhile, Acting Central Jakarta Mayor Head (Plh), Premi Lasari remind s Satpol PP urban village and sub-district personnel to increase their supervision with patrolling. "Supervision needs to be intensified thus PKL will not occupy the sidewalk again. Sidewalk must be used according to its function for pedestrian and people with disability," she affirmed.